Video released by Animal Defenders International shows the elephant that appears alongside Reese Witherspoon and Robert Pattinson in the film Water for Elephants, being beaten and electric-shocked during training. Water for Elephants, a romantic drama set in a 1930s animal circus in the USA, stars Reese Witherspoon and Robert Pattinson. But the biggest star of the film is 45-year-old Asian elephant Tai, who plays Rosie, supplied by the performing animal supplier Have Trunk Will Travel, of California. However shocking video, filmed at Have Trunk Will Travel in 2005, has been posted online by Animal Defenders International (ADI) after the London premier, that tells a different story. Please contact ADI today and find out how you can speak up for Tai and all animals being abused in the entertainment industry. If you live in the UK, please contact info@ad-international.org, if you live in the U.S. please contact usa@ad-international.org and ask for a Water for Elephants Letter Writing Pack. Contact your local theater with a copy of the DVD we can provide you, and politely ask them to make the right choice and stop showing the film. Contact ADI for a letter writing pack with sample letters to Water for Elephants actors and movie makers, and sample letters to the editor to help you raise your voice for Tai and the other animals abused for entertainment. Share the link to the video on your Facebook and other social networking sites, to spread the word to family and friends. In April 2011, the last elephant with a British circus, was removed from Bobby Roberts Circus after ADI filmed the horrific abuse of the old elephant in the circus winter quarters. 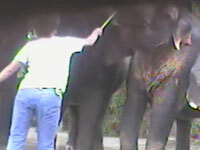 It was one of a series of investigations by ADI of the systematic abuse of circus elephants, most recently the beating of elephants at the Great British Circus in 2009. Anne had also been hired out for television work.